This voyage consisted of two back-to-back cruises. The first was a 12-day cruise to the Caribbean from Cape Liberty, New Jersey calling at San Juan, St. Maarten, St. Lucia, Barbados, Antigua and St Kitts. The second was a nine day cruise from Cape Liberty to Port Canaveral, Miami and Nassau. A call at Royal Caribbean's private island in The Bahamas, Coco Cay​, was canceled due to weather conditions. Instead, the ship overnighted in Nassau.. Both cruises had historic elements. 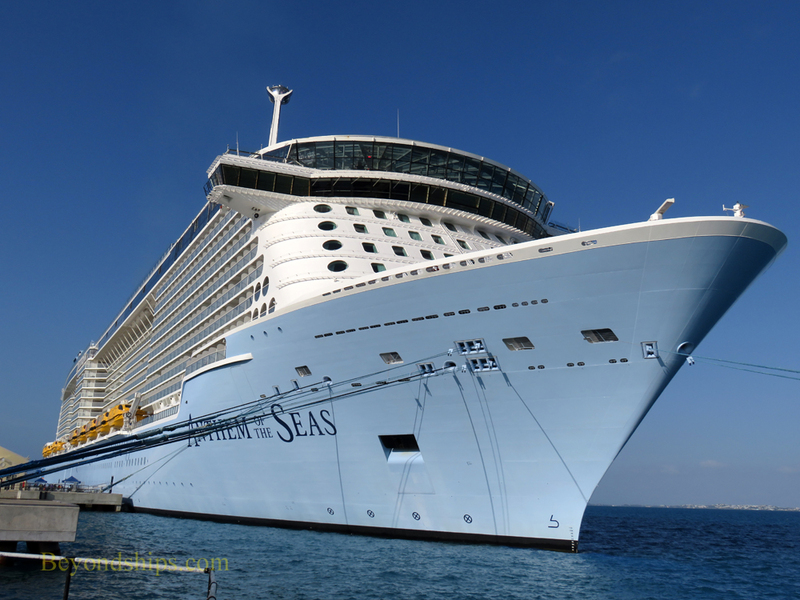 As of this writing, Anthem of the Seas is the fourth largest cruise ship in the world. Consequently, her maiden call at St. Lucia was historic because she was the largest ship ever to dock in Castries. (See separate article). Her call in Miami was similarly historic because she was the largest cruise ship thus far to call at the cruise ship capital. The two cruises had somewhat different atmospheres. The Caribbean cruise had the feel of drifting along through lazy days in the sun. Most of the passengers were of retirement age and there were few children. The second cruise had a faster pace. It was shorter and so there was less time to do all the things this ma mammoth ship has to offer. Also, due to winter breaks at schools, there were many more children and young families aboard. Also, while it was still warm, the average temperature was not as high as it was during Anthem's voyage through the Caribbean. On both voyages Anthem was operating in top form. Anthem entered service in 2015, not only a large ship but a technologically advanced ship. In addition, her décor and some of the concepts that debuted with this class of ship were different than previous Royal Caribbean ships. The fact that she was so different did not sit well with some cruisers. In addition, problems with the technology and the bad luck of being caught in a fierce Atlantic storm damaged her reputation. Anthem has emerged from that cloud is now an award-winning ship. In part this is due to changes made by Royal Caribbean in some of the original Quantum class concepts. 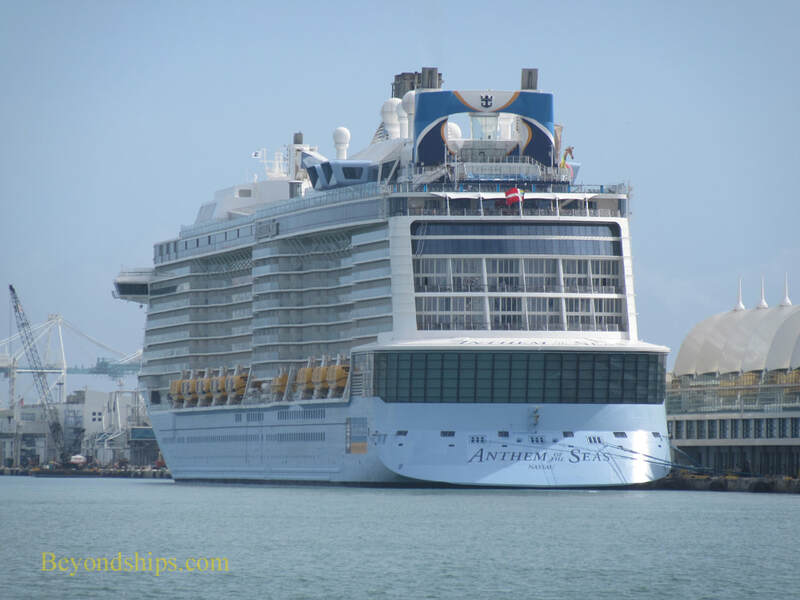 Whereas Anthem was once more like the ships in the fleet of sister brand Celebrity Cruises, she is now a more sophisticated version of the Royal Caribbean product. However, the most significant factor in bringing Anthem to her current level is her officers and crew who are passionate about their ship. The Quantum class ships debuted with a concept called Dynamic Dining in which there was no main dining room but rather four complimentary dining rooms each with a different theme and menu. Passengers could dine in any of the four as well as in the extra-charge specialty restaurants at whatever time they wanted. Unfortunately, the technology needed to make this concept work let Royal down and there were operational problems. In addition, passengers complained that they missed having the same table with the same waiters each night. As a result, Dynamic Dining has been discontinued on Anthem. Interestingly, now that its gone, more and more passengers tell me how much they liked Dynamic Dining. The dining system on Anthem is now similar to the dining systems on other Royal Caribbean ships. Two of the dining rooms are devoted to the traditional passenger ship system where each guest is assigned to a specific table at either the early or late dinner seating. The other two dining rooms follow a flexible dining system in which guests can have dinner at a time of their choosing. Even in the flexible system, the restaurant staff make an effort to seat the passengers with the same waiters each night. I found the staff in each of the dining rooms friendly and efficient. The menus provided variety and the food was good. Two of the dining rooms are open for breakfast and lunch (sea days only). The jewel of the lunchtime operation has been the Tuti Salad station in which the staff will prepare a salad from a wide variety of ingredients to your instructions. This has now been augmented with an elaborate dessert station with cakes, pastries and ice cream. Guests staying in certain suites and Pinnacle members of Royal Caribbean's loyalty program have access to the Coastal Kitchen. This is similar in concept to Celebrity's Luminae restaurants, The Haven restaurant on Norwegian's larger ships and the Grills on the Cunard Queens. There is a different menu than the other dining rooms and more opportunity for special orders. Service is efficient and personal as the number of passengers is relatively small and many passengers who have access to this venue have all of their meals there. On the port days, I usually had lunch in Cafe 270. While its salads are not up to the Tutti salads in the dining room, they are good. Also, there is a variety of hot and cold sandwiches as well as a pastries counter. You can then eat your meal in the 270 lounge with its magnificent views through the windows that encircle the ship's stern. An alternate lunch time venue was Sorrento's Pizzeria. Good pizza but it is disappointing that Royal Caribbean has discontinued the design your own pizza option. Anthem has several other complimentary dining venues including the Windjammer (buffet); the Dog House (hot dogs) and the Solarium Bistro. There are also extra-charge specialty restaurants. Chops Grille, Royal Caribbean's flagship steakhouse, can always be relied on for an excellent filet dinner. Disappointingly, my favorite Chops dessert, the huge fresh-baked chocolate chip cookies in a pan with ice cream was missing from the menu. Izumi has shifted its menu more towards Japanese cuisine whereas it had been more of an Asian-fusion restaurant. Still, quite enjoyable. 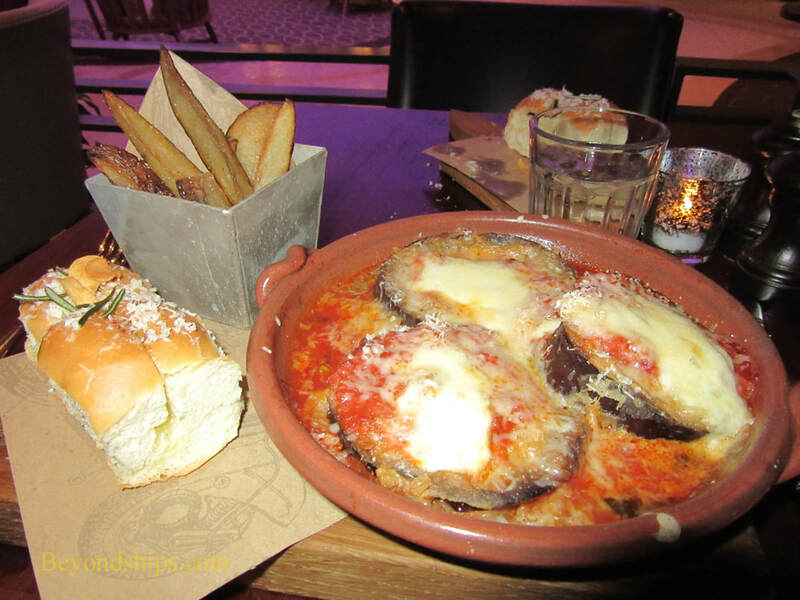 I had several dinners at Jamie's Italian, Developed by British chef Jamie Oliver, this venue offers his take on familiar Italian dishes. It is sometimes different than what you might expect. For example, the excellent lasagna has a sweet taste, which my server said comes from the use of pumpkin in the sauce. On most cruise ships, the main entertainment venue is the ship's theater. On Anthem, it is the Two-70 lounge. This is a giant room that stretches across the stern of the ship and rises several decks high. Across the back are windows that can become video screens. There are also a group of moveable video screens in the center. The screens can be used for spectacular shows and as scenery for live performances. The room is furnished like a cross between a theater and a living room, giving it a restful atmosphere. During shows, performers may pop up among the seats from the floor or drop down from the ceiling. The main show in Two-70 is Spectra's Cabaret. It is not a traditional cabaret but rather an other worldly show with singers, dancers and acrobats. There is no discernible plot, so yo can see it a number of times without getting bored. Furthermore, there has been changes in the cast including the lead since my last voyage on Anthem and they give a different spin to the show. Two-70 is also used for theme parties, the Captain's Corner question and answer session, receptions and game shows including The Quest. Anthem also has a theater. This is used for productions of Royal Caribbean's homemade musical “The Gift” and the West End musical “We Will Rock You.” Each show is done several times during a cruise so all can see them. They are interspersed with shows by visiting comedians, singers etc. The two production shows are performed well but do not lend themselves to repeat viewings. “We Will Rock You”'s lead guitarist Joyce Kuo, however, is excellent and a pleasure to listen to over and over. 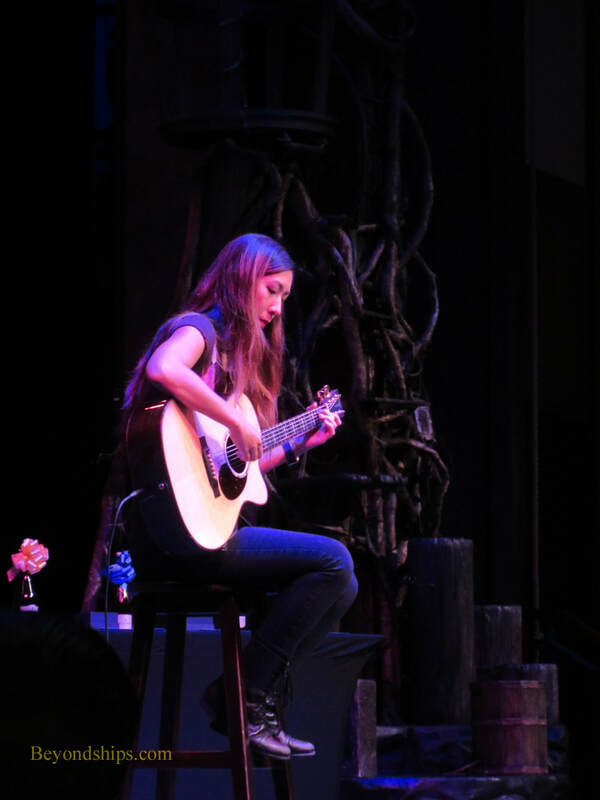 On evenings when the production show is not scheduled, she occasionally performs solo shows in the smaller venues playing songs by the likes of Eric Clapton, George Harrison and Jimi Hendrix very impressively. During the day, Anthem has the usual shipboard activities such as trivia contests and bingo, Unfortunately, there is no enrichment programming. Many passengers elect to stay by the ship's pools (indoor and outdoor) or to lounge in the vast glass enclosed Solarium. There is also the amusement park with the bumper cars, the surfing simulator and the sky diving simulator. 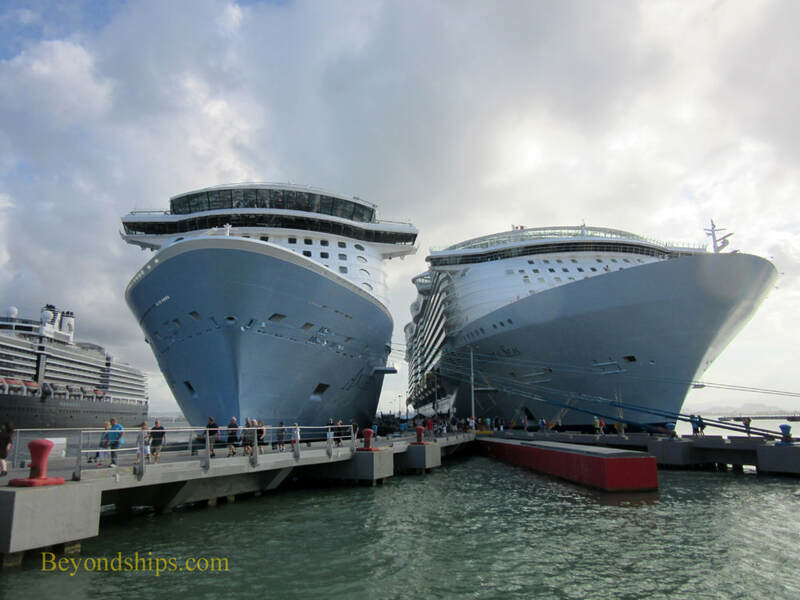 Royal Caribbean tends to emphasize these features in promoting the ship which while attracting more action -oriented cruisers tends to give sophisticated cruisers the wrong idea about the ship. The amusement park is only a relatively small discrete section of the ship. Anthem's size and layout allow passengers to select the features that appeal to them and ignore those that do not interest them. On both cruises, the ocean when Anthem was sailing down the East Coast on both cruises was like a lake. Accordingly, Anthem sailed smoothly as she did throughout the Caribbean. At the end of the Caribbean cruise, a storm stood between Anthem and home. The captain made the decision to alter course to avoid the storm, which required the ship to go faster as more distance was involved. A medical emergency required the ship to increase to top speed, which brought the ship closer to the wake of the storm. While there was some motion, the ship's public areas remained populated with passengers. (Anthem arrived at Cape Liberty approximately nine hours ahead of schedule). On the second cruise, high winds prevented tendering off of Coco Cay. Therefore, Anthem stayed in Nassau overnight. She had no difficulty handling the seas when she left Nassau or on the way back to Cape Liberty. Above: Anthem with fleetmate Allure of the Seas in San Juan. ​Below: A dinner in Jamie's Italian specialty restaurant.